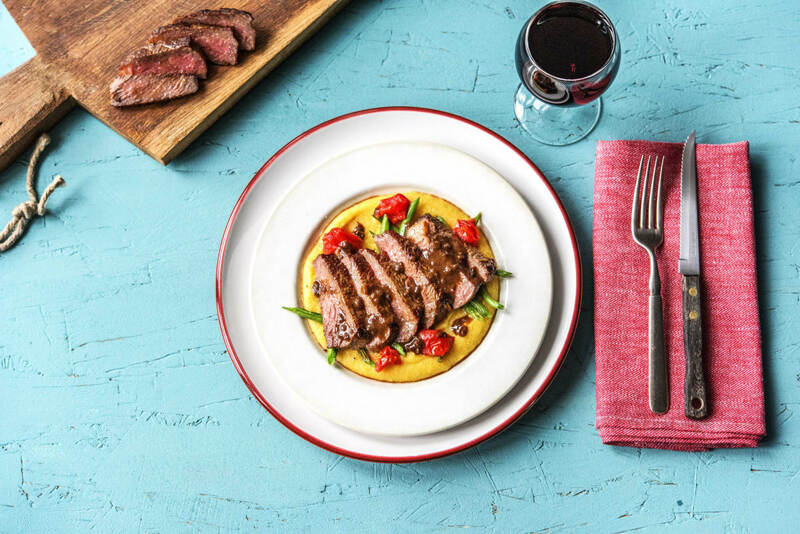 Polenta and steak may not be a pairing you see every day, but when you taste it, you’ll start to wonder where it’s been all your life. The cornmeal porridge soaks up the drippings from the beef, becoming a swirl of intensely rich and meaty flavors. 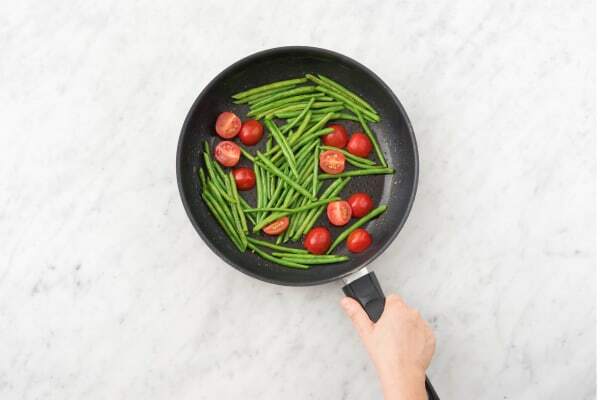 To balance out all that decadence, we’re introducing green beans and tomatoes, cooked until they burst with tangy juices, plus a balsamic reduction that provides a jolt of fruit-forward acidity. Wash and dry all produce. 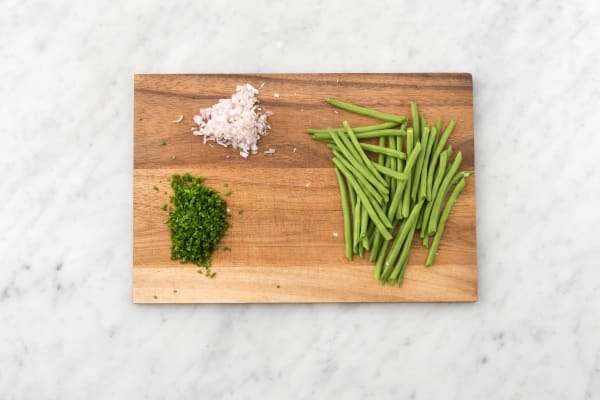 Trim any stems from green beans, then cut into 2-inch pieces. Halve, peel and mince shallot. Finely chop chives. 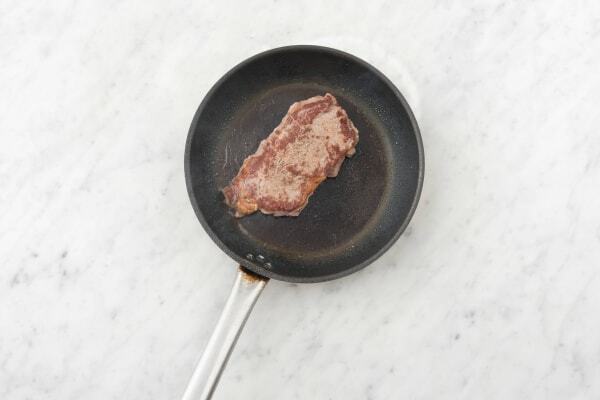 Pat steak dry with a paper towel. In a medium pot, bring 2 cups water, stock concentrate, and a pinch of salt to a boil. When water is boiling, lower heat and reduce to a simmer. Whisk in polenta and cook until thick but still oozy, 3-5 minutes. 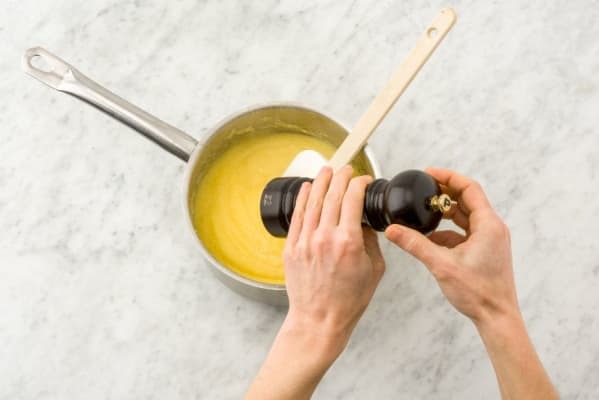 (TIP: Add a splash of water if polenta becomes stiff.) Stir in Parmesan. Season with salt and pepper and remove from heat. Heat a drizzle of oil in a large pan over high heat. Season steak all over with salt and pepper. Add to pan and cook to desired doneness, 3-6 minutes per side. Remove from pan and set aside on a plate to rest 5 minutes. TIP: Loosely cover steak with aluminum foil to keep warm while resting. Meanwhile, heat a drizzle of oil in same pan over medium-high heat. Add shallot and cook until slightly softened, 1-2 minutes. Add a splash of water and scrape up brown bits from bottom of pan. Allow liquid to evaporate. 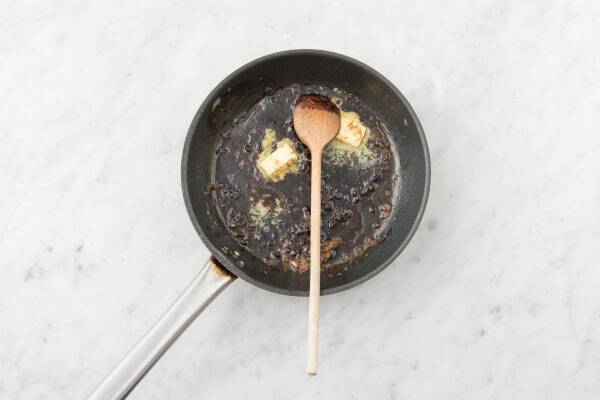 Remove from heat, then add balsamic glaze and 1½ TBSP butter to pan. Stir until butter melts, then mix in any juices that have accumulated on plate from steak. Season to taste with salt and pepper. Slice steak against the grain. If polenta has cooled, reheat over medium-low heat, adding a few splashes of water to loosen, if necessary. Divide between plates, then top with green beans, tomatoes, and steak. Drizzle sauce over steak and garnish with chives.